“A male chocolate lab, approximately one year or less, was turned into a vet clinic by good Samaritans who found him unable to move on the side of the road… …He has been attacked by something – other dogs, mountain lion in the area, or ??? and is beat up pretty bad. The clinic will keep him for 3 days for an owner reclaim – but it is unlikely. He will be euthanized on Tuesday if no one shows up to claim him. They have him on pain meds and antibiotics but he will need surgery to close the large gashes under his arms and chest. He is shocky so it is hard to evaluate his temperament. Sweet but seems shell shocked or unsocialized. He is eating and improving and could make a recovery if given the chance. Located in eastern Washington near the Idaho border. Contact me if able to help. Serious inquiries only please. Susan offered to finance his surgery, recovery and find a foster home for him, if the rescue group could transport him west. The woman who posted the information knew a vet who would do the necessary procedures at a reduced cost. Eli – What a sweet face! 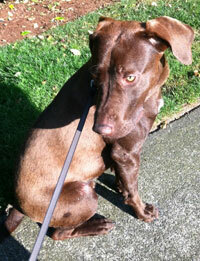 “Here’s our morning update for our little chocolate lab pup – about a year old per Dr. Vogel. Dr. Vogel had a chance to examine him more carefully this morning and he believes the injuries most likely resulted from another dog. He has skin damage that extends into the muscle a bit but likely won’t need stitches, just a thorough cleaning of all wounds. Most of his injuries are on his legs and one on his ear. Dr. Vogel hopes to be able to perform the procedure today or tomorrow at the latest. I’ve asked him to also neuter him, microchip and give him his DHPP and Bordetella. I will also ask him to please run a stool sample, too. Susan, is there anything else you require? …Does anyone have any leads on possible rides for Eli from Spokane to Seattle this weekend. Dr. Vogel is wonderful. So helpful and caring about little Eli. Thanks to him for all his hard work and compassion. With multiple lacerations, after his surgery Eli had 8 drain tubes and over 60 stitches. But with a new name and a successful surgery behind him, Eli was transported west to Susan on July 10th by a generous family. 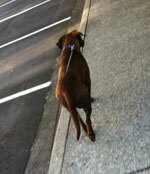 Susan brought him to Dr. Frank and Harmony Animal Wellness Center for post-op monitoring while she rehabilitated him. 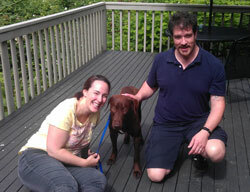 By the end of July, instead of a foster home, Eli had received the gift of a new permanent home with Josh and Marijke!! …Eli has, slowly, been getting more comfortable with us, every day we can see improvement. He does not feel the most secure every day, as some loud noises and quick movement will still startle him, but not as much as day one. All of his wounds healed up very nice, he will have some nice scars but that only adds character, right? We were surprised at how fast he healed. We thought that the large gash under his right front arm would take longer than it did, but really, I removed the last stitches less than two weeks after we picked him up and they fully healed by the next week. He has been learning basic commands like heal and sit, wanna go out, things like that… …we wanted him to feel safe before we started overloading him with homework. He has gotten along well with every dog we have met. He will walk up and sniff them so that is good, we can tell that he wants to be friends, he is just not sure what he is suppose to do. He does not play with us or with his toys, but we also noticed that he was very happy and playful around about three different dogs now, all three female and older. [We’re thinking that being around another dog] will help him become the dog that he really is inside. …yes go ahead and post this story up on your Facebook page. Don’t you just love happy, new beginnings for our animal friends??? – from the people who cared enough to stop even though he wasn’t moving and bring him to the clinic; to Tracie; Bernice; Robin; Dr. Vogel; the family who transported Eli; everyone else involved we don’t know about; and of course Susan, Josh and Marijke. Happy Labor Day Weekend – Enjoy! 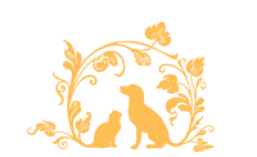 This entry was posted in All, Dogs and tagged animal rescue, dog, dog rescue, veterinarian monroe. Bookmark the permalink. Wow, what a great story and and beautiful dog. Thanks for sharing. WOW !!! How wonderful is that !!! Loved hearing about this !!! Beautiful story. Glad and very happy to know that there are individuals who are ready to help dogs who have had a very tough life. Eli is a such handsome dog. It is comforting to know that his wounds have healed and his life has improved after finding a lovely home! Thanks for sharing such a lovely story. Best wishes to Eli and his new family! what a great story — thanks for posting it! I am proud to say I have met Eli and he is a wonderful dog. He now lives with my brother and sister-in-law, Josh and Marijke. 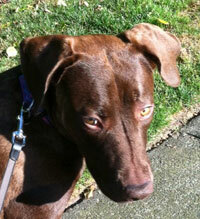 Eli is slowly adjusting to living with a loving family and he shows great potential. In the few days I spent with him, he became more comfortable with his surrounding and showed great trust in Josh and Marijke. I look forward to spending more time with him soon because I know he will fit in with all of our family.